I make this distinction because this film’s impact on a non-superstitious cucumber is very different to its effect on You People, who take it for granted the events in this indie docu-style movie COULD HAPPEN, and then can’t close your eyes at night for fear it COULD HAPPEN to you. And writer-director Oren Peli knows just how to scare You People. We think we know horror because our senses have been deadened by what the Hollywood system calls horror. Just like we think we know hamburgers because we eat at McDonalds (whether we like it or not and whether we admit it or not) – but visit a Ma and Pa griddle and suddenly the stinging of the onions leaps out at you, as does the red freshness of the ground meat patty on the crisply toasted buns; the cheese is aromatic, the tomatoes bleed with seedy juice, the lettuce is garden crisp, and a hint of ketchup cheekily enhances this audacious co-mingling of the five food groups. PARANORMAL ACTIVITY is a hamburger from Ma and Pa’s griddle. Movie works on the premise elucidated by Stephen King: don’t show the monsters. Young couple Micah (if you squint real hard, a young Eric Bana) and Katie (don’t need to squint to see her two mungus assets) move in together and experience the titular paranormal activity, which consists of doors moving, loud noises and sounds of people running around. But we see NOTHING. Film is shot entirely on a hand-held Vidcam that Micah buys to record the phenomena. The obvious visual parallel is THE BLAIR WITCH PROJECT in almost every stylistic aspect. (Like BLAIR WITCH, the footage was supposedly “recovered” – and edited into this movie by some nice editors who had nothing better to do than spend three months in an editing bay, then hire a marketing firm to create internet buzz, then attend film festivals since 2007 trying to score major distributors…) The conceptual parallel is – or to be blunt, blatantly ripping off the scares from – THE HAUNTING (1963). We get the backstory when a gutless psychic (Mark Friedrichs) visits and asks Katie questions. Seems she’s been plagued by demonic visitations since she was 8, so the psychic goes into Wet Pants Mode, “My expertise is dealing with ghosts, not demons.” (Oh, so you have no expertise.) “Dealing with demons is different.” (That’s right – to deal with them, you have to pretend even harder. )Micah taunts the demons with his vidcam and even sets up an EVP Microphone (oh, it’s a comedy! ), which makes Katie scared that he is “angering” the entities. Sho’ nuff, when the psychic returns, desperately called by Katie for some help, he assures her by saying he can’t help in the least, and wets his pants into the night, exclaiming the demon is outraged he is there. Evidence for his gutless behavior? – his behavior itself. Simply because he says “The demon is angered,” You People believe him. The scares are sudden and admittedly effective. 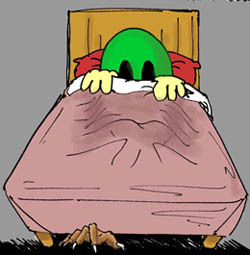 Certain sounds at any hour of the day are scary – such as a gigantic THOOM! that rattles your ribcage – but hear them suddenly in the middle of the night and your hairs rise autonomously, whether you are a ghost whisperer, a practising catholic or a nullifidian cucumber. On a budget somewhere between nothing and shoestring ($11,000), Peli has carved his 15 minutes, but it’s a quality fifteen, with solid old fashioned thrills. He only stoops to the level of convention once – where he ramps the speed of the film to emulate THE RING’s style – trouble is, that relapse comes in the film’s final frames and compromises an otherwise above-average pants-browner. The moral of the story is: Don’t Taunt The Hamburger, You People! Starring: Katie Featherston, Micah Sloat, Mark Friedrichs.